Brody Roybal (Northlake, Ill.) and Declan Farmer (Tampa, Fla.) each tallied five points and 10 other players collected at least one point to lead the 2018-19 U.S. National Sled Hockey Team past South Korea, 8-0, here today in its final preliminary round game of the 2018 Para Hockey Cup. "It wasn't the start we wanted, but we found our speed and chemistry there in the second period and came away with a nice victory," said David Hoff, head coach of the 2018-19 U.S. National Sled Hockey Team. "Now, it's important we take care of ourselves tonight and come ready to play for the championship game tomorrow." The U.S. (4-0-0-0/W-OTW-OTL-L) will face host Canada in tomorrow's (Dec. 8) championship game of the 2018 Para Hockey Cup. Puck drop is set for 4 p.m. at Western Fair Sports Centre. For the third time in four games, Farmer opened the scoring for the United States when he found the back of the net 6:52 into the game. Roybal started the play by carrying the puck into the slot and firing a shot that was deflected by a South Korean player. Farmer picked up the loose puck and sent a shot past netminder Yu Man Gyun for the 1-0 lead. With 1:24 to play in the stanza, Kevin McKee (Chicago, Ill.) scored his second goal in as many games to double the U.S. lead. After collecting the puck from Rico Roman (Portland, Ore.) at the left faceoff dot, McKee sent a high-rising shot over Man Gyun and into the back of the net for the 2-0 lead entering the first intermission. A five-goal outburst in the middle stanza gave the U.S. a commanding 7-0 lead. Farmer started the scoring with a trio of goals in the first 6:22 of the frame. Roybal again initiated the goal, this time giving the puck to Farmer at the top of the left faceoff circle where he cut towards the slot and beat Man Gyun with a right-handed shot. Less than a minute later, Farmer struck again by finishing a nice passing play from Colin Gooley (Baldwinsville, N.Y.) and Roybal with a backhanded tally. Farmer's third goal of the frame came by tapping in a cross-crease pass from Roybal on a two-on-one odd-man rush. Luke McDermott (Westerlo, N.Y.) then connected near the midway point of the period on a powerplay tally off assists from Ralph DeQuebec (San Pedro, Calif.) and Noah Grove (Frederick, Md.) to extend the U.S. advantage to 6-0. With just two second to play in the frame, a passing play from Farmer and DeQuebec resulted in Roybal pushing the score to 7-0 in favor of the U.S. after two periods of play. In the final frame, Travis Dodson (Deming, N.M.) tallied a powerplay marker off an assist from Josh Sweeney (Portland, Ore.) with 3:50 to play to account for the 8-0 final. NOTES: Brody Roybal (Northlake, Ill.) was named the U.S. 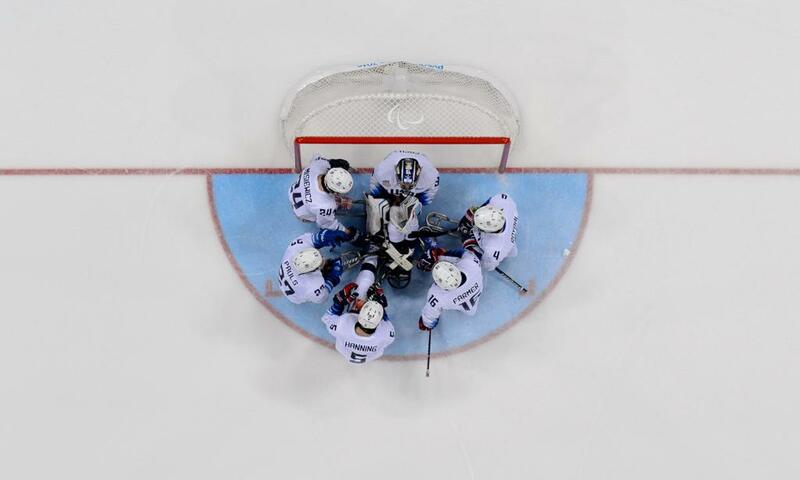 Player of the Game ... For complete statistics, click here … Deloitte, Labatt USA and Toyota are proud sponsors of the U.S. National Sled Hockey Team … For complete coverage of the U.S. National Sled Hockey Team, click here.